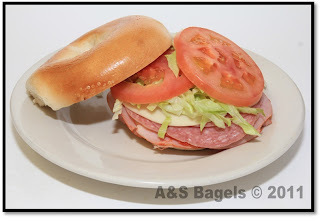 A&S Bagels Bagel Blog: "The Anna"
“The Anna” Ham Cappy, Salami and Provolone on a Bagel/Roll. Stop in anytime, and try one of our great tasting bagel sandwhiches. A&S Bagels is open 24 hours a day, 7 days a week. The image pictured above was photographed by Rosanna Talarico. All the pictures, images and content of this web blog are copyrighted and/or owned by A&S Bagels, Inc and/or A&S Bagels has permission for use. No use, or reproduction of any pictures, images or content appearing on this web-site is permitted without the express written permission of A&S Bagels, Inc.